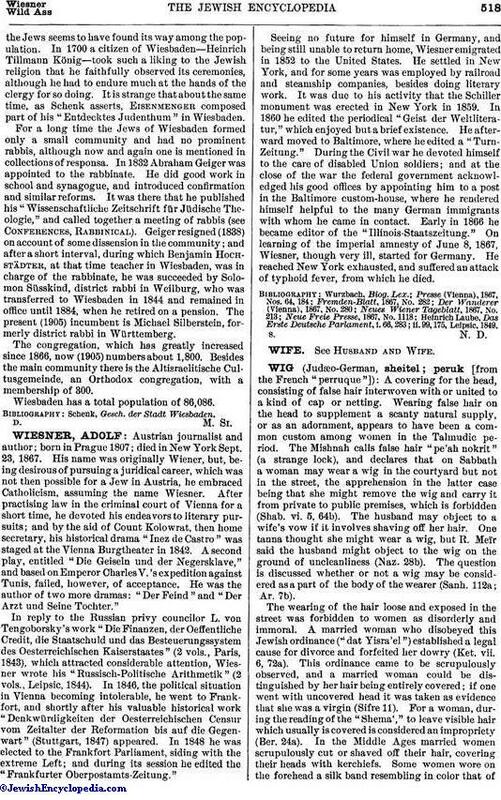 Austrian journalist and author; born in Prague 1807; died in New York Sept. 23, 1867. His name was originally Wiener, but, being desirous of pursuing a juridical career, which was not then possible for a Jew in Austria, he embraced Catholicism, assuming the name Wiesner. After practising law in the criminal court of Vienna for a short time, he devoted his endeavors to literary pursuits; and by the aid of Count Kolowrat, then home secretary, his historical drama "Inez de Castro" was staged at the Vienna Burgtheater in 1842. A second play, entitled "Die Geiseln und der Negersklave," and based on Emperor Charles V.'s expedition against Tunis, failed, however, of acceptance. He was the author of two more dramas: "Der Feind" and "Der Arzt und Seine Tochter." In reply to the Russian privy councilor L. von Tengoborsky's work "Die Finanzen, der Oeffentliche Credit, die Staatschuld und das Besteuerungssystem des Oesterreichischen Kaiserstaates" (2 vols., Paris, 1843), which attracted considerable attention, Wiesner wrote his "Russisch-Politische Arithmetik" (2 vols., Leipsic, 1844). In 1846, the political situation in Vienna becoming intolerable, he went to Frankfort, and shortly after his valuable historical work "Denkwürdigkeiten der Oesterreichischen Censur vom Zeitalter der Reformation bis auf die Gegenwart" (Stuttgart, 1847) appeared. In 1848 he was elected to the Frankfort Parliament, siding with the extreme Left; and during its session he edited the "Frankfurter Oberpostamts-Zeitung." Seeing no future for himself in Germany, and being still unable to return home, Wiesner emigrated in 1852 to the United States. He settled in New York, and for some years was employed by railroad and steamship companies, besides doing literary work. It was due to his activity that the Schiller monument was erected in New York in 1859. In 1860 he edited the periodical "Geist der Weltliteratur," which enjoyed but a brief existence. He afterward moved to Baltimore, where he edited a "Turn-Zeitung." During the Civil war he devoted himself to the care of disabled Union soldiers; and at the close of the war the federal government acknowledged his good offices by appointing him to a post in the Baltimore custom-house, where he rendered himself helpful to the many German immigrants with whom he came in contact. Early in 1866 he became editor of the "Illinois-Staatszeitung." On learning of the imperial amnesty of June 8, 1867, Wiesner, though very ill, started for Germany. He reached New York exhausted, and suffered an attack of typhoid fever, from which he died. Heinrich Laube, Das Erste Deutsche Parlament, i. 66, 283; ii. 99, 175, Leipsic, 1849.